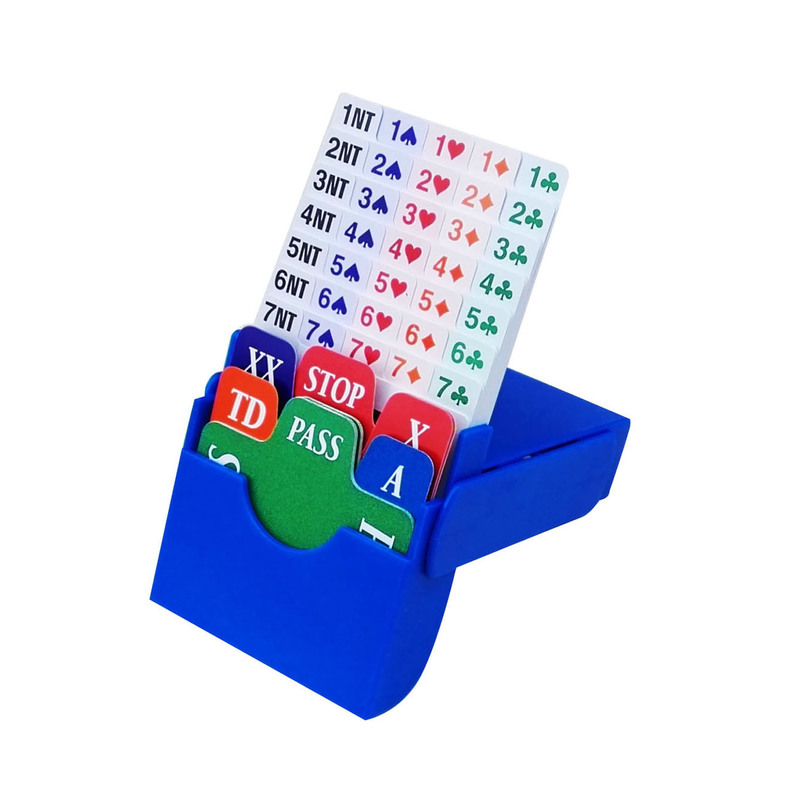 Trump Suit Bridge Accessories supply regular bidding box(set of 4,Blue,incl 100% plastic bidding cards).Easy to open and close. Now Plastic insert cards are more and more popular due to its durability and comfort during bridge playing.It is also washable and water proof,it enables you to wash them when cards are splashed by coffee or tea or something else.Most bridge clubs use bidding boxes filled with cards designating every possible call.The cards provide an instant review of the bidding and eliminate the possibility of mishearing an auction. In particular,we are able to print on the bidding box with your unique Bridge Club Name,Club Mark,Club Logo,Sponsor Name, Championship Name or Tournament Name.With the special marking(or name)on bidding box,club members can play bridge with your club’s unique bridge accessories,the Championship can expand its own publicity,the Tournament would have more places to advertise for its Sponsor,could charge for extra Sponsorship fee for expanding Sponsor's publicity. The price is for neutral bidding box(set of 4 boxes).If you need customized bidding box,minimum quantity is 24 sets(of 4).Extra cost for logo printing/logo sticker is US$3.0 per set (of 4 boxes). Colors now available: Red,Yellow,Blue,Green and Orange. Trump Suit Bridge Accessories supply regular bidding box(set of 4,Blue,incl 100% plastic bidding cards).Easy to open and close. The price incl postage of regular post service(30-60 days) to almost every country of the world.